Created by Mark Drilling on Dec 15, 2011 2:54 PM. Last modified by Mark Drilling on Feb 7, 2012 11:21 AM. 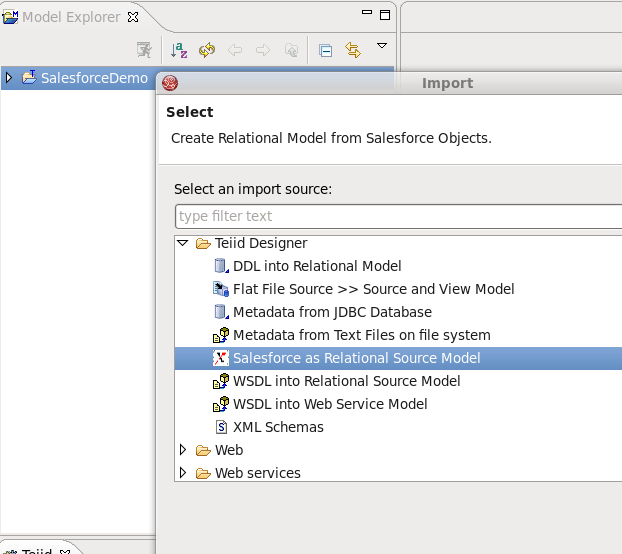 This article will guide you through an example of connecting to Salesforce as a relational source, using Teiid Designer. It is assumed that you have already installed Teiid Designer version 7.6 or higher. Teiid Designer requires a running Teiid server for Data Preview. 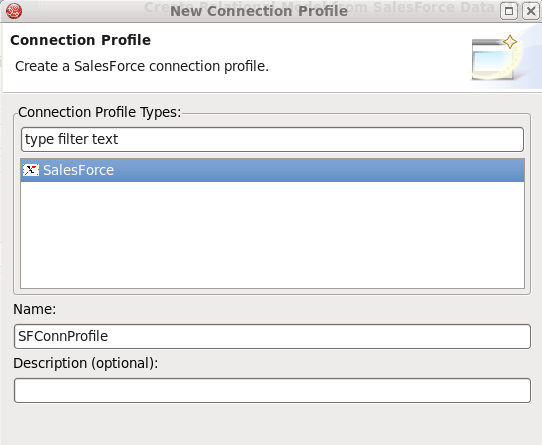 We will use the Data Preview capability to test our Salesforce source. 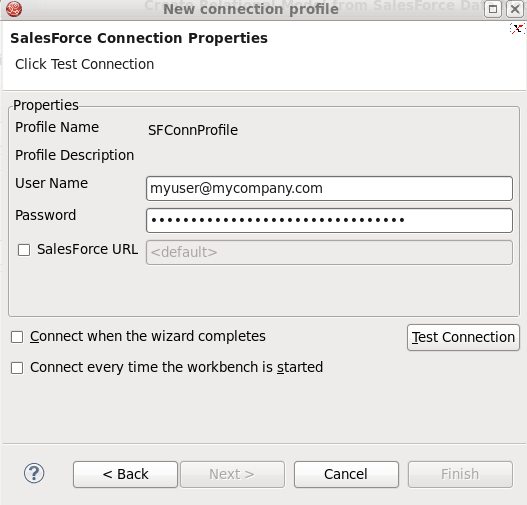 On the Salesforce Connection Properties page of the Connection Profile Wizard, enter your Salesforce User Name <myuser@mycompany.com> and Salesforce Password. The 'Password' is the Salesforce password and security token combination as required by Salesforce. Your Salesforce user must also have API access permission granted in Salesforce. Click on the 'Test Connection' button to verify a successful connection. Click Next. 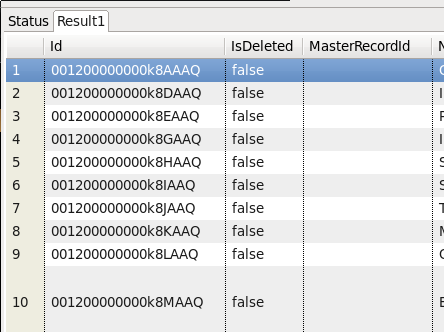 Upon finish, you will see two additional Models in the 'Model Explorer' view, 'SalesforceExtensions' and 'SFModel'. 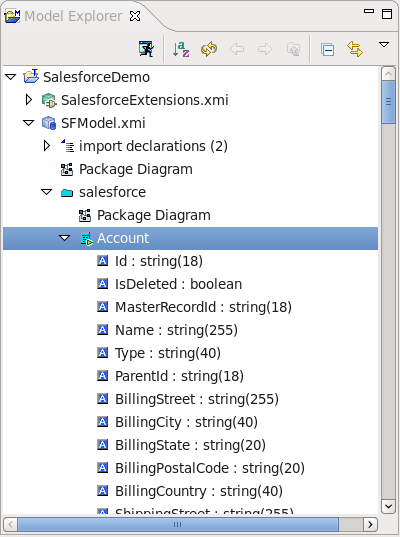 'SalesforceExtensions' contains model extensions required by the Salesforce translator - it can be ignored. 'SFModel' is the source model which exposes your Salesforce data as a relational table. Congratulations, you have successfully connected to Salesforce!